The Notice of Proposed Rulemaking (NPRM) related to public charge is still pending. The public comment period closed on December 10, 2018 and the rule has not yet been finalized. The proposed changes have not been finalized or taken effect, current public charge policy remains in place for immigrants residing in the U.S. CCALAC’s comments on the NPRM can be viewed here. NLS-LA Public Charge Fact Sheet (English, 2 pages) NEW! NLS-LA Public Charge Fact Sheet (Spanish, 2 pages) NEW! NLS-LA Public Charge Client Flyer (2-Sided, English/Spanish) NEW! On Sept. 5, 2017, the Trump administration announced it is terminating the DACA program. Congress has been unable to reach a solution protecting DACA recipients and other eligible individuals. Due to a court order, USCIS is currently accepting DACA renewal applications (but not new DACA applications). Employment authorization documents (EAD) remain valid until the expiration date. Immigration attorneys must have a law license, verify it here. The following is a collection of advocacy resources that can be used when speaking to patients, staff, elected officials, and other external stakeholders. Please be sure to check for updates throughout the year. Covered California Open Enrollment, a.k.a. “OE4”, is November 1, 2016 through January 31, 2017! Check out these great resources from Covered California to help health centers and enrollers assist consumers with applying for and renewing their health coverage. Resources Toolkit – Includes the 2017 Renewal Toolkit, recordings and slides from enroller webinars, Community Partner Briefings, and downloadable guides and notices. Assisting Medi-Cal Eligible Consumers FAQ – A key resource for health center based certified enrollers. Printer-friendly Collateral Materials – FREE, downloadable PDF’s of Covered California collateral materials. Many of these materials include editable text fields that you can use to customize the piece to include your health center contact information. The materials on this page are available free of charge, and are print-ready. Please feel free to download, print, and use these materials at your convenience. 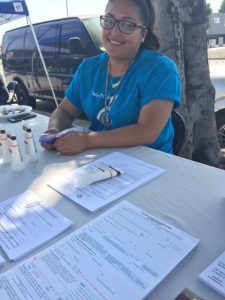 A volunteer at Westside Family Health Center does voter registration during National Health Center Week 2016. In Los Angeles County, community health centers are in a unique position to increase voter registration and get out the vote because of the their deep ties to the community. There are many things to consider when planning a voter registration and voter engagement campaign. Since community health centers are 501(c)3s and health care providers, there are certain legal requirements they must adhere to comply with their tax exempt status and to be considerate to their patients privacy. Pursuant to Senate Bill (SB) 75, individuals under age 19, up to 266 percent of the federal poverty level (FPL), who do not have, or are unable to establish, satisfactory immigration status, are now eligible for full scope Medi-Cal benefits. The necessary system updates in CalHEERS and the State Automated Welfare Systems (SAWS) were completed on time and the official implementation of SB 75 began as scheduled on May 16. In LA County the Department of Public and Social Services (DPSS) transitioned children from restricted scope to full scope in a series of batch transactions the week of May 16. Cases that did not transition successfully will be verified manually by DPSS staff. DPSS aims to complete the manual transition of remaining cases by the end of June. Medi-Cal effective date will be May 1 for all of these children, regardless of whether they transitioned in May or June. In advance of SB 75/Health4All Kids implementation this month, the following are materials and resources to support enrollers and other clinic staff with the implementation of the expansion of Medi-Cal to all eligible children, regardless of immigration status. Pursuant to Senate Bill (SB) 75, Medi-Cal eligible individuals under age 19, up to 266 percent of the federal poverty level (FPL), who do not have, or are unable to establish, satisfactory immigration status, will be provided with full scope Medi-Cal benefits starting no sooner than May 1, 2016. CCALAC provided the Outreach, Enrollment and Retention Peer Network with a slide deck to assist with training other clinic staff on SB 75 implementation. Members are free to use and/or modify the slides as they see fit. The presentation will be updated if and when information changes or as additional information becomes available. California will soon be expanding full-scope Medi-Cal to cover all lower-income children under 19 years old, regardless of immigration status. The expansion will happen no sooner than May 2016. Families are being encouraged to enroll their children NOW in restricted-scope Medi-Cal, also known as “emergency” Medi-Cal, in order to transition to full scope Medi-Cal as soon as the program is expanded. Change is Coming! Help prepare your patients for Health4All Kids! This week’s featured resource is “5 Things You Need to Know About Health Coverage for ALL California Children” providing information for parents and families on Health4All Kids! Help prepare your clinic’s patients for the changes coming to children’s coverage next year! When families come in to renew for My Health LA, don’t miss a great opportunity to provide them with some initial information about this change! Let parents know that starting sometime after May 1, 2016, ALL low-income children, up to age 19, will be eligible for full scope Medi-Cal, regardless of immigration status. Help families enroll their children into restricted scope Medi-Cal now, so they will transition to full scope in May. The “5 Things You Need to Know” flyer is a product of The California Endowment’s Health Happens Here/Health4All Campaign and is available in English and Spanish. This week’s featured resource is the recently updated Family PACT Client Eligibility Determination Policy and eligibility forms! The October Family Planning, Access, Care and Treatment (Family PACT) update bulletin was posted to the Medi-Cal website on October 16, and includes important updates to the Client Eligibility Determination Policy. Effective November 1, 2015, the Family PACT program’s eligibility determination policy has been updated to reflect the use of Modified Adjusted Gross Income (MAGI) counting rules for eligibility determination in order to comply with the Patient Protection and Affordable Care Act (ACA) and to clarify policy regarding other health coverage and confidentiality. The Client Eligibility Certification (CEC) form (DHCS 4461) and the Retroactive Eligibility Certification (REC) form (DHCS 4001), have been updated to reflect these changes, effective November 1. The forms can be found, in English and Spanish, on the Family PACT website. Please note that the new language on the forms refers to taxable household income and claimed dependents, which may be more confusing for some patients than the old forms. Open Enrollment is right around the corner! Now is a great time to make sure you have important phone numbers and links to resources close at hand. The current outreach and enrollment featured resource is Covered California’s Resource Directory, with contact information for the help line, IPAS assistance, links to job aids, and more. MHLA fact sheets are now available in seven languages! The MHLA fact sheets have been translated into seven languages and are now available in the “For MHLA Participants” section on the MHLA web-site. At the beginning of summer, the MHLA Program Office conducted an analysis of the five most-used languages (after English & Spanish). These languages are: Armenian, Chinese, Korean, Tagalog and Thai. The “What is MHLA?” and “How do I Enroll?” fact sheets are now available online in those seven languages! Please download and distribute these to your Participants as needed. Please contact your program advocate with any questions or feedback. MHLA has released an updated version of the “Next Steps” resource that can be provided for participants after enrollment (English and Spanish versions are available). “Next Steps” is a useful one-pager for enrollees that explains where their medical home is, provides annual renewal date and instructions, and includes member services contact information. MHLA has also released a new OEA Tips Sheet to provide enrollers with information about the different types of reports in OEA, especially those that can help with planning for renewals. All MHLA enroller resources and training materials are available on the MHLA website, under “For DHS and Community Providers” in the “Eligibility Information and One-e-App” tab. The first 90-day renewal notices are now being mailed to My Health LA (MHLA) patients who enrolled in August 2014 at the One-e-App (OEA) pilot sites. The renewal period for enrollees at other Community Partner (CP) clinics will begin in June. CP clinics must perform in-person renewals annually for all MHLA participants. Participants are eligible to renew starting 90 days prior to their enrollment date; they will receive a renewal letter from MHLA at 90, 60 and 30 days before the renewal is due. A MHLA renewal can be processed at any Medical Home and the participant has the choice to select any Medical Home Clinic upon renewal. LADHS held several webinar sessions at the end of April on the OEA renewal process. The presentation provides an overview of the OEA features that tell the CP who is due for a renewal, reviews what information needs to be checked and updated on the application, and reminds enrollers which documents need to be uploaded again. The PowerPoint presentation is now available on the MHLA website. Go to “For DHS and Community Providers,” log in, then select the “Eligibility Information and One-e-App” tab. The presentation is available with or without audio narration, items “h” and “i” under “One-e-App Training Manuals”. If you have questions about the renewals process, please contact your Program Advocate. CCALAC’s new Outreach and Enrollment Featured Resource is LADHS’s new My Health LA (MHLA) Person Clearance Tip Sheet. The purpose of the tip sheet is to clarify the process of the Person Clearance Screen in One-e-App (OEA). Careful person clearance prevents the assignment of two different Person ID numbers to the same individual and helps enrollers avoid mistaking a new applicant for someone who is already known to OEA. The tip sheet provides detailed steps for performing an accurate person clearance in OEA. This week, LADHS released a new One-e-App (OEA) Received and Upload – Tip Sheet for enrollers detailing the OEA process for uploading documents and ensuring that patients are not disenrolled due to incomplete applications. The tip sheet also provides instructions for checking document uploads and notifying the OEA help desk and MHLA Program Advocates in case of issues with documents. The tip sheet is a byproduct of a small workgroup comprised of LADHS MHLA program leadership, CCALAC staff, and Member clinic representatives who convened to pull together this resource for MHLA enrollers. National and California immigrant rights organizations have partnered with Covered California to spread the word to all communities that immigration status should not deter anyone from applying for health insurance coverage. With the president’s recent executive order announcement on immigration, there is renewed attention on undocumented residents; the partners in this effort want all consumers to feel confident that they can apply for coverage for lawfully present family members without fear of consequences. As part of this effort, Covered California has developed a new Immigration Fact Sheet (currently available in English, Spanish, Chinese, and Vietnamese – Korean coming soon), to reinforce the message that information shared in health coverage applications will be kept safe, secure and confidential and will not be used for immigration enforcement purposes. Consumer stories are powerful and personal. As certified enrollment counselors you are in the unique position to interact with individuals and seeing the positive impact of accessing health care. By amplifying consumer stories, you can encourage others to sign up for coverage or seek in person assistance. On November 20, 2014, the president announced executive actions that his administration will be taking to help fix our immigration system. A new Deferred Action for Parental Accountability (DAPA) program will allow undocumented people who have a U.S. citizen or lawful permanent resident son or daughter to apply for work authorization and protection from deportation, if the person has been in the U.S. since January 1, 2010. An estimated 4.1 million people should qualify for this program. The existing Deferred Action for Childhood Arrivals (DACA) program will be expanded and now will cover people who entered the U.S. before their sixteenth birthday and have lived continuously in the U.S. since January 1, 2010. People who were “aged out” of DACA by being older than age 31 on June 15, 2012, are now eligible to apply, regardless of how old they are now. Approximately 300,000 people will be benefit from these changes. Certain spouses of lawful permanent residents may be able to get their lawful permanent resident (“green card”) status through a waiver process. Spouses of U.S. citizens are currently able to apply through this process. Under federal law, undocumented immigrants with “deferred action” status are not eligible for health benefits under the Affordable Care Act; however, in California individuals who qualify for the Deferred Action for Childhood Arrivals initiative do qualify for Medi-Cal if otherwise eligible (CA uses state funds, not federal). Advocates believe it is likely that immigrants affected by the President’s action will “be in the same situation” as those who qualify for the Deferred Action for Childhood Arrivals initiative. It is important to note that to date, the Department of Health Care Services has not yet determined the effect Obama’s executive action will have in California. There is also speculation that families with mixed immigration status could be more likely to explore coverage possibilities now during open enrollment since that the fear of deportation may have been lifted for some family members. Although the program has not started, the documents below from the National Immigration Law Center may help answer questions and advise immigrants of steps they may want to take to prepare.